Best Flowers to Mumbai On Valentine's Day express the colors of love with our wide range of long stem roses, gerberas, lilies, orchids, carnation and more. Send Valentine's Day Flowers to Mumbai. When you think of Valentine's Day gifts to Mumbai, flowers are the first to come to mind, isn't it so? Just because that is nothing more beautiful that can express love in a better way. The language of Valentine's Day flowers is diverse, their varieties and colors are tied to so many emotions that you could express passion, care, admiration, appreciation all by gifting one kind or a bunch of mixed Valentine's Day flowers to Mumbai. Place your order to express yourself on Valentine's Day. Somehow flowers in vases get a preference because they last longer than bouquets prettifying your room and spread their sweet fragrance for a longer duration. If red roses are not what you want to pick for your valentine this year, a bunch fresh Valentine's Day flowers in a vase cold be the next best choice. Keep it simple with a vase full of pretty carnations or make it more exotic with colourful orchids the choice is totally yours. We offer Valentine's Day flower delivery in Mumbai in round, oval, rectangular other fancy transparent as well as colored vases. To add a further hip look, some of the flower vase arrangements also come tied with pretty bows. Get going and express the colors of love with our wide range of long stem roses, gerberas, lilies, orchids, carnation and more. Teamed up with contrasting colors as well as individual tones, each of these blooms flaunts a superior look and elegant style. To make the Valentine's Day flowers to Mumbai sweeter we also offer combinations with chocolates, cakes, sweets, dry fruits and more. Discover, a huge range of sassy gifts for all occasions with www.mumbaionlinegifts.com making gifting a real pleasure. Sending gifts to Mumbai is easy with us and we ensure timely delivery to all locations in the city. 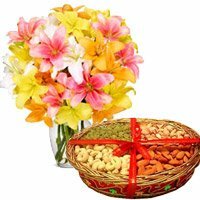 You can also add that special surprise touch to the gift opting for our midnight flower delivery to Mumbai option. Make your move now and place an order to avoid the last minute rush. We Deliver the orders placed by you to send Flowers and Valantine's Day flowers to All over Mumbai.